Emma Rudkin is the founder of Aid the Silent and is a two-time Miss San Antonio. (Jan. 24, 2018) -- Meet Emma Faye Rudkin. 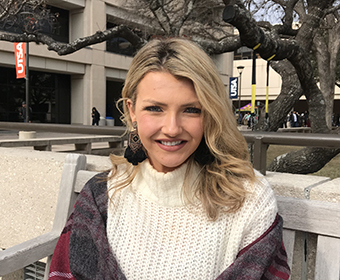 This UTSA student is advocating for individuals who are deaf and hard of hearing through her nonprofit, Aid the Silent. Born in Boerne, Texas, Rudkin was four years old when she was diagnosed as legally deaf. When Rudkin was 16, she attended a Young Life camp and met Morgan Champion, who became a mentor to her. Champion helped Rudkin realize her childhood dream to advocate for individuals who are deaf and hard of hearing. In 2015, Rudkin entered her first beauty pageant and won. She was named Miss San Antonio. The win provided the UTSA student with the platform that she needed to launch her non-profit organization. Aid the Silent was born shortly thereafter. In 2017, Rudkin won the Miss San Antonio pageant again. Serving as a repeat titleholder provided her with new opportunities to gain visibility for the causes she wanted to advance through Aid the Silent. “Winning Miss San Antonio catapulted the organization and provided a platform to join the conversation about the challenges the deaf and loss of hearing people face,” Rudkin said. According to Rudkin, an honors student pursuing her degree in communications and a minor in non-profit management, children who are deaf frequently are not given access to the resources and tools they need to communicate with others. In the United States alone, for example, only 20 states require private health insurance companies to cover the cost of hearing aids. “I want to open the eyes of the community regarding the issues and the struggles that deaf people encounter,” Rudkin said. Aid the Silent supports the deaf and hard-of-hearing community through deaf ministry, deaf research, deaf education and deaf resources. Its goal is to be a source of support to help and financially assist economically disadvantaged deaf or hard-of-hearing children and teens through ministry-related activities, sponsorship programs, hearing products, speech resources and learning. It provides hearing aids, classroom equipment, camping scholarships, family and individual American Sign Language lessons, speech therapy and other ministries. In 2017, Rudkin organized the first Aid the Silent “Good Vibrations” music festival. The live music and arts festival provided a forum for people who are deaf and hard-of-hearing to enjoy music. The event offered captioning and bluetooth technology, which allowed listeners to feel the vocals and musical vibrations on their backs. More than 2,000 people attended the festival, including 350 individuals who were deaf. Aid the Silent’s future plans include purchasing a building to expand its operations, continuing its work nationally and internationally with deaf schools and advocating for the adoption of deaf children.